Natural stone refers to products quarried from the earth. Used as building materials and decorative enhancements, popular types of natural stone includes granite, limestone, marble, quartzite, slate, travertine and onyx, to name a few. Ask someone to describe the benefits of natural stone and they’re likely to begin with beauty. After all, the look of countertops, fireplaces, floors, patios, stairways, walkways and entire homes is often enhanced with natural stone. Natural stone is durable. Practically indestructible, it withstands fire, hail, heat, rain, snow and wind. What’s more, when stone is used on countertops or as tile on floors, it resists scratches, stains and burns. That makes it a popular choice in well-used rooms like kitchens and bathrooms. It’s also often the pick for high-traffic areas like hallways and family rooms. Natural stone is efficient. Stone has a thermal mass that naturally insulates. Homeowners save energy (and money!) that would otherwise be needed to heat or cool a house. Natural stone is environmentally friendly. People who choose natural stone over synthetic materials benefit the earth several ways. A natural product, stone does not require energy for production. The result? Pollution is not a by-product of the production of natural stone. 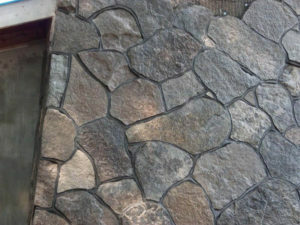 Natural stone is easy to maintain. When properly sealed, it’s relatively simple to care for. Cleaning and maintenance vary by application, but you’ll begin by keeping your natural stone free of debris. Natural stone is unique. It’s a one-of-a-kind natural product that sets a home or stone building apart from others. Density, veining and shading or color can vary from one box or shipment to another. Its uniqueness makes it a favorite choice of architects, builders, designers and homeowners who are striving for something special. Natural stone is versatile. It’s available primarily in tiles and slabs, but in an almost infinite array of colors, sizes and types. Granite, travertine, limestone, marble and slate are just a few of your many options in natural stone. Natural stone is affordable. Compare natural stone to other building material options and you may be pleasantly surprised. Highly durable, it lasts for years. What’s more, it’s an investment that can bring good returns in the long run. In many instances, stone can improve the resale value of a home.